Allow me to take the liberty to write to you this open letter although you don’t know me. I met you in person, for the first time, during a conference of Ministers of Information from non-aligned countries. The conference that took place in New Delhi, India, was convened in July 1976 and was chaired by Prime Minister Indira Gandhi. Burundi delegation was sitting very close to Tanzania’s delegation. You were then Director of the Tanzania News Agency. And at that time, you gave me the impression of a very sharp and friendly journalist. The last time, I think, I saw you was in Dar es Salaam during the visit Pope Jean-Paul II paid to your country in September 1990. I was one of the several international journalists covering the papal visit to Tanzania, Burundi, Rwanda and Côte d’Ivoire. Mwinyi was then President of Tanzania. Since then, I know you’ve had a brilliant career as, inter alia, Minister of Foreign Affairs and last but not least, as the Head of State of Tanzania. You are now among the most respected persons in your country, on the African continent and the world at large. I am also reliably informed you played a key role in helping Mwalimu Julius Nyerere during the first round of negotiations that led to the Arusha Peace and Reconciliation Accord for Burundi signed on 28th August, 2000. We, Burundians, were very much delighted when you were entrusted with seconding President Museveni in the mediation process over the current Burundi conflict. The East African Community Heads of States couldn’t have made a better choice. I take the liberty to write to you because I believe you are also a caring and loving father and grandfather. I hope you’ll kindly accept that I refer to this human dimension of your eminent personality and call upon your « ubuntu ». Now, allow me to briefly introduce myself to you. I am a Burundian citizen leaving in France. I am a seasoned independent journalist and political analyst. I am also an international communication Consultant in media and communication. I believe my citizenship and my intellectual and professional profile give me some legitimacy for taking this unusual initiative. Indeed, I write to you because your recent report submitted to the EAC’s Heads of States during their 8th September 2016 Meeting in Dar es Salaam is very much worrying. Very many Burundians are afraid the current mediation process you are relentlessly conducting could fail. And this failure would be a disaster for Burundi in particular and the whole of EAC and African Great Lakes region in general. Allow me to point out why this mediation process you are courageously conducting is likely to fail. First of all, because, if I may use your very own words, « there is a glaring lack of seriousness and willingness » from the EAC region in this Burundi crisis to engage in a mediation process that can produce a quick solution to the conflict. Actually, the African Union ineffectiveness has set the tone. The visit of five African Heads of States to Pierre Nkurunziza was pathetic sight to watch. Numerous reports were produced by highly respected Burundi civil society organizations and international human rights NGO’s, by UN and AU observers. All these reports are very alarming and the EAC’s Heads of States are well aware that the situation is, every passing day, dramatically deteriorating. Yet, the EAC and the mediators seem only concerned by giving time to Pierre Nkurunziza in order for him to reinforce and entrench his power. Meanwhile Burundi conflict is spilling over to the neighbouring countries. And yet the region seems unable and unwilling to stop the instability and insecurity caused by Pierre Nkurunziza. I am very sorry to disagree with the balance your report tends to strike between the points of view from the current Burundi government and the opposition. Expressions like « There are those who are saying »…. « Others have expressed… Some say…. There are allegations by some… » lead one to think there can be a balance of forces between the lion and the gazelle in Serengeti or Ngorongoro Tanzania wonderful National Parks or a balance of forces between Pierre Nkurunziza, the predator, and his victims. Moreover, the report gives a depressing impression that the most pressing issue in this Burundi mediation process is for the EAC’s Heads of States to find more money in order to extend your mission. The second reason why this mediation process is likely to fail, apart from the EAC’s inaction and indulgence to Pierre Nkurunziza, is that it’s wrongly named. Indeed, the current Burundi conflict mediation process is not a « dialogue » between the « de facto » government of Burundi and the opposition. Between the two parties, there is a huge political divide. Therefore, the current search for peace in Burundi should correctly be named like the first one. It’s yet just a second peace « negotiations » process like the first one that took place in Arusha and was completed in August 2000. Amicable settlement of a conflict through a civilized dialogue is only possible when the two parties share fundamental vision on key issues put on the table. Indeed, as you now know, there is no way at all the current Burundi government will ever change its mind through what is wrongly called dialogue without political, diplomatical, economic and even military coercion. Pierre Nkurunziza will use all his power in order to sabotage the mediation process and to reinforce his dictatorship. The same applies for the opposition. It will also use all its political and diplomatic influence and even military means in order to get Pierre Nkurunziza out of the game. Therefore, there is, for the time being, no crossroad where the two parties could meet, sit around a table and share a common vision on Burundi’s future. In Burundi, we have a time-old and deeply rooted tradition of « Bashinga-ntahe », a peace settlement and conflict mitigation system. Such peace judges, respected and trusted by the people, listen as you did to all parties and, at the end of the day, indicate which party is wrong and which one is right. May I humbly suggest you to take inspiration from this Burundi’s traditional peace and justice mechanism. Because I believe there is no chance, whatsoever, for the EAC’s Heads of States to take a strong and quick decision regarding Burundi crisis. Independent and wise international « Bashinga-ntahe » from Africa and abroad, eminent personalities, women and men, from all walks, could bring both parties to accept the decision taken by them. And afterwards their decision would be blessed and endorsed by the EAC’s Heads of States, by the African Union and by the United Nations. You are very well placed to know that Heads of States often have very many contradictory and conflicting agendas. The popular say indicating there is never « love » but « interests » between States finds a particular application field in this Burundi conflict mediation process. Indeed, nobody knowing the turbulent and recent history of our African Great Lakes region can expect the EAC’s Heads of States to ever come up with a compelling decision against one of their pair, namely Pierre Nkurunziza. Some EAC’s Heads of States seem even to ignore or not to understand the fundamental reasons why Burundians, especially the youth, are fighting and dying for every day. Why EAC’s Heads of States have never condemned the horrendous crimes committed by Pierre Nkurunziza so far? Quite recently, while you were submitting your report to them, Pierre Nkurunziza who was supposed to be with his pairs in Dar es Salaam was instead testing new beds in a lodge at the border between Tanzania and Burundi. What a shame! And the EAC’s Heads of States didn’t, even diplomatically, express their discontent after Pierre Nkurunziza’s obvious contempt for EAC. In 1996, when a severe economic embargo was imposed to Pierre Buyoya after his second coup d’Etat, a report funded by USAID and produced by the East African Chamber of Commerce based in Nairobi, proved that local, regional and international mafias had monopolized the trade between Burundi and the neighbouring countries which were losing huge amounts of income and taxes. After submission of this report to Daniel Arap Moi, the former Kenya President decided to break the embargo. He immediately instructed his services to allow flights to Burundi to depart from Eldoret. And that was the end of the embargo. Taking into consideration this historical background one could understand the reasons why the EAC’s Heads of States are hesitating now to use a formal and strict economic embargo in order to put pressure on Pierre Nkurunziza and to bring him around the negotiations table in Arusha II. But Pierre Nkurunziza has already anticipated this embargo. Infringing EAC’s conventions on free movement of people and goods, he has almost closed the borders between Burundi and his neighbouring countries of the North Corridor and he has prohibited Burundi farmers to sell their productions in Tanzania and Rwanda. Therefore, EAC’s Heads of States should not hesitate any longer and should enact an economic embargo since Pierre Nkurunziza has already locked himself in his deadly narrow-minded policy. Actually, the root cause of the current Burundi crisis is not the third term Pierre Nkurunziza has grasped by force. Of course this third term is definitely illegal. But Pierre Nkurunziza is using it just as an opportunity or a pretext to enslave Burundi people and to wreak havoc in the country and to stay on power for ever and at any cost. After all, the current self-proclaimed president of Burundi could have imposed his cursed term only by putting a heavy hand on the country using his police, military, intelligence forces and his militia to oppress Burundi’s population. Pierre Nkurunziza could have exerted his power without killing, torturing, maiming, emasculating, and jailing thousands of youths or opponents, without covering criminal rapes of women, without cheating during the electoral process, without destroying the political parties, without putting fire to free media, without banning free civil society organizations, without sending hundreds of thousands people into exile, without ruining the country’s economy through a mega corruption system, without encouraging his damned militia, Imbonerakure allied with the infamous Interahamwe, to permanently harass the people in some Bujumbura’s quarters and upcountry and to extort money from the people. Finally, Pierre Nkurunziza could have been a typical dictator of the kind we all know in some African countries without insulting neighbouring or remote nations who used to be Burundi’s partners and friends. Much more worrying! Pierre Nkurunziza’s high ranking people, in his party, have been instructed by him to ignite the torch of hate speech and stigmatisation of Tutsi, to kick start a genocide process against them and to commit numerous crimes against humanity whose victims are both Hutu and Tutsi. 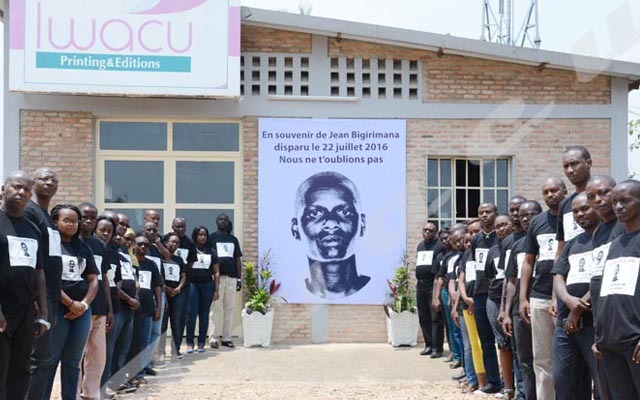 Please try to convince EAC’s reluctant Heads of States that Burundi people are fighting for their fundamental rights, among others, for the right to life, to work, to education, to health, for the freedom of expression, for the freedom to demonstrate and to create and run private enterprises. These basic human rights are not negotiable but they are now denied to the Burundi’s people by Pierre Nkurunziza’s insane regime. Therefore, since Pierre Nkurunziza has no alternative political programme other than using violence and terror in order to destroy Burundi fundamental democratic principles, the Arusha Peace and Reconciliation Accord and the current constitution, since EAC’s Heads of States are staying idle and indifferent to Burundi’s fate and suffering, please establish an International and Independent Panel of « Bashinga-ntahe » that will tell Pierre Nkurunziza he is wrong and that he should immediately step down and let a new national union government, comprising both ministers from the government wing and from the opposition wing to rebuild the country. A national union government without Pierre Nkurunziza could prepare new elections through a transparent and fair electoral process. It could deter Burundi rebellions to use weapons and rather to prefer nonviolent fight against Pierre Nkurunziza’s dictatorship. By the way, these rebel forces could be integrated into the current army and police as this was successfully accomplished after the signature of Arusha Peace and Reconciliation Accord. Arusha the Peace and Reconciliation Accord in order to fight against impunity. However, if the current mediation process through the EAC’s Heads of States or through the suggested system of international Bashinga-ntahe cannot produce a quick and viable solution for Burundi, please consider requesting the EAC’s Heads of States to stop this mediation process that is becoming an expensive and fruitless diplomatic initiative. Pierre Nkurunziza’s victims deserve a better consideration and Burundians committed to fight for human rights and democracy will find a way to liberate themselves alone. As you may know, the much respected Mwalimu Julius Nyerere has been the strongest support and mentor for Prince Louis Rwagasore during the fight for independence in early 1960’s. Even the money to cover the travel of Rwagasore’s envoys to UN Headquarter in New York in order to plead for independence was paid for by a private company established in Tanganyika Territory at the request of Mwalimu Julius Nyerere. You personally, you can now play the same key role Mwalimu Julius Nyerere played for Burundi. « Yes you can » help Burundi to liberate itself with democratic and pacific methods, the same methods Louis Rwagasore used to get independence from the former colonial power. « Yes you can » also help Burundi to get rid of Pierre Nkurunziza’s dictatorship imposed by terror as Mwalimu Julius Nyerere did with Idi Amin Dada in Uganda. Finally, allow me to call upon your « ubuntu » as mentioned above. The rainy season has probably started in countries where Burundi refugee camps are scattered around in Tanzania, DRC, Uganda, Kenya, Rwanda, Malawi, Mozambique and Zambia. Hundreds of thousands of Burundian people live in horrendous conditions, in these camps, under tents or fragile homes. Very many kids are suffering from hunger, diseases and cold. Many of them are alone without their parents to take care of them and to send them to school. This is an unbearable tragedy. Please do all you can, as a caring and loving father and grandfather to save these kids at least. Please tell the EAC’s Heads of States to stop beating about the bush in this Burundi crisis. Please tell them to stop taking evasive actions. Instead, tell them to show « glaring seriousness and willingness » in order to help Burundi to get rid of Pierre Nkurunziza, an Idi Amin Dada’s scaring reincarnation. Good piece. If only Mkapa and others werenit deaf and blind. or give them 20 years ,Simple as that because it seems that it will help to satisfy that hunger of each tribe they have for dictatorship. The fact that international enter in our politic is because our intellectual are not putting together a PERMENANT FORMULA which is good and respectfully to the right of majority hutu and the right to minority protection. We have witnesses the success of arusha accord . we can still improve it by allowing any president to rule till years because 5 years is for countries which manage what they got already but african president need really more than 10 years to achieve real changes.The problem is only based on how to accept transition after such long time and how to make them accountable on their acts.